We perfected being a small town long ago and choose to remain so. As our community grows, we continue to call each other by our first names, gather and meet in-person, share civic duties and demonstrate our intense pride of place. Though we may grow in popularity and visitation, Munising will continue to be an inviting, proud and community-minded small town. It is our pleasure to be one of the stewards of such a wonderful small town, Munising, Michigan. Unlike many other small rural towns across the Midwest, we are fortunate to have a diversified economy. Our largest employer, Neenah Paper, is one of the most successful paper and packaging manufacturing businesses in the Midwest targeting specialized products. Other large employers in the community are Timber Products and Alger Max Correctional facility. We are blessed with plentiful and beautiful natural resources with one of the Midwest’s most popular national recreation areas, Pictured Rocks National Lakeshore. This national lakeshore provides us with almost 800,000 visitors annually. These visitors come from not only the Midwest, but also from across the country and overseas to enjoy the area. This large influx of visitation has led to a boom in small business growth, both in the county and in Munising’s downtown. Tourism is now the leading economic driver in Munising and has not only led to tourism-based business growth but has led and helped sustain and support small businesses outside of the service industry. Many of our attraction businesses are some of the most successful in the upper Midwest and many are known for, and take pride in, their first-rate customer service. Much of our business growth has been “home-grown”, started with local talent. The DDA recognizes that this diverse economy has led to our town’s economic sustainability, success and popularity. Where many small communities see empty storefronts in their downtown, Munising is recently nearing full occupancy in our downtown storefronts; a large feat for a small community. Munising has worked together collaboratively to solve issues regarding infrastructure needs brought on by tourism growth. Numerous city and non-motorized projects are in the planning stages, while others have already been completed. As visitation has increased, the Munising DDA has completed sidewalk, alley and lighting projects. We have also added decorative and functional items such as trash cans, benches, bike racks, wayfinding signage, planters, city park improvements, art banners, outdoor art endeavors, outdoor city decorations and other placemaking projects. The DDA invests thousands on an annual basis towards gardening efforts in our downtown. One of our most successful endeavors has been our local DDA façade grant program. For over ten years, the Munising DDA has awarded over 125 matching façade grants to businesses within the DDA district. This nearly $500,000 investment from the DDA has resulted in more than $1.1 million in downtown infrastructure improvements. We have worked with outside agencies, including the Michigan Economic Development Corporation (MEDC), in bringing grant monies to assist in infrastructure improvements to the City dock and the Pictured Rocks Interpretive Center. The DDA continues to work with local and regional partners, business owners and the community to make this area an economically vibrant and attractive place to visit, live and work. 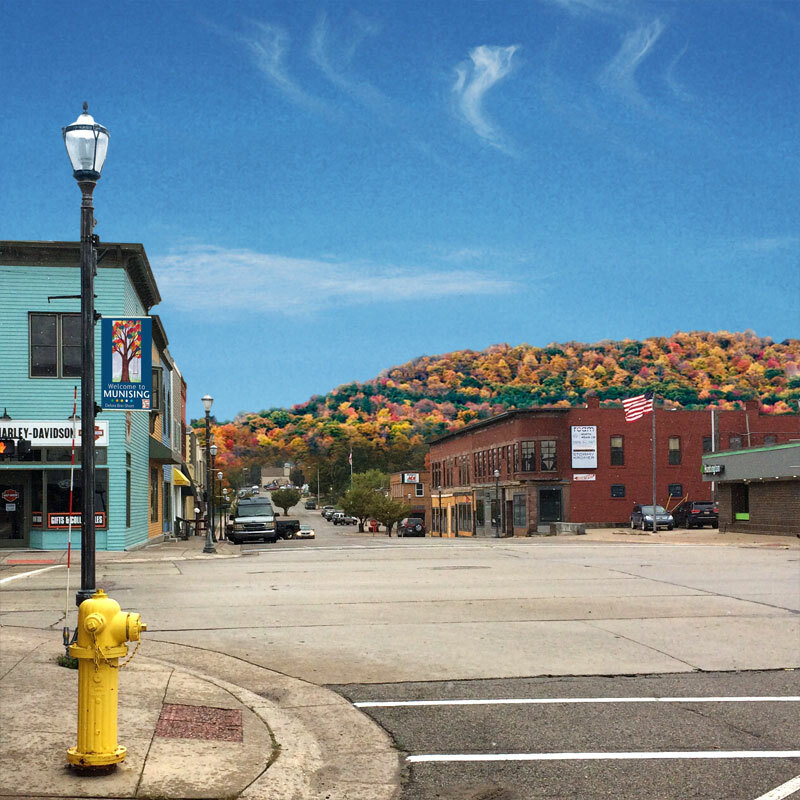 The Munising Downtown Development Authority will be holding a required informational meeting on Monday, May 6, 2019, 4:00 p.m. at Munising City Hall. The state of Michigan (Recodified Tax Increment Financing Act, 2018 PA 57) now requires two informational meetings to be held annually and requires a 14-day notice is to each of the taxing jurisdictions. The Downtown Development Authority (DDA) was established pursuant to Michigan Public Act 197 of 1975, as amended, and supports private investments, business growth, projects and activities through sponsorships and grants, capital improvements to public infrastructure and additional programs designed to increase economic activity. Funding for DDA programs comes from a number of sources such as grants and captured tax increments, which are increases in property taxes that result from new investments. The Munising DDA meets twice monthly on the first and third Wednesday @ 8:00 a.m. @ the Fuzzy Boyak Welcome Center, 129 East Munising Avenue. If you would like to be on the agenda, please call us at 906-387-1110.